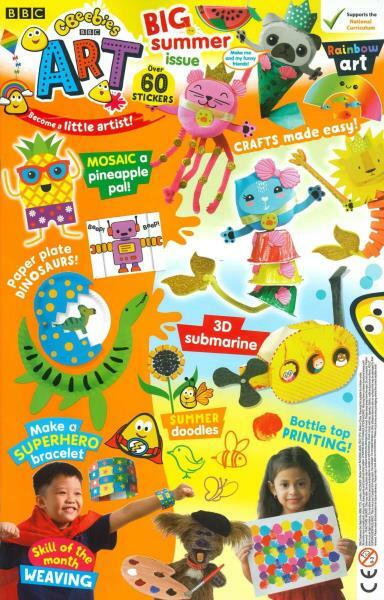 Cbeebies Art magazine is what you have been looking for if you want your children to start their art practices early. Buy a single copy or subscription to Cbeebies Art magazine. This is a great time to invest in a magazine that will identify and highlight the creative in your child, and put it into motion through their interactive activities. There are some which will require your experienced hands so make sure to relax and partake in the invigorating environment provided by the fun activities! We are all familiar with the art and DIY craft television programs but how many of us have the patience or the time to provide to our young ones while they’re jumping in anticipation of the engaging art shows, waiting to get their hands dirty? Well, Cbeebies Art magazine is the answer! This is the perfect way to show your little one that he can enjoy art as well as learn something from the practice of it. Help your child by providing all the materials that he needs and making the process both enjoyable and informative for him. Art is the way little children can learn about techniques of application and imagination which are so important in life later. This magazine is perfect for all things art and craft, so make sure to order yours today! Pre-school magazines are also available that engage your toddler in extremely fun ways so make sure to look at everything they have to offer before you make your choice. The world of kid entertainment and learning is a wide one and filled with many options but find one that has mastered the art of keeping the child busy while enlarging his art and knowledge horizons and Cbeebies Art is definitely the choice to make! Lots of great ideas. My granddaughter has enjoyed many hours engrossed in the numerous activities. Some have been too advanced for her, she is four years old, but they are easy to adapt. Great, well illustrated, challenging ,, great things to make and gifts.. Inventive and varied content. Always met with enthusiasm. bought for 5 year old. 2 year olds clamour to watch and touch. All stop for Mr Maker. Front content bag annoying as allows everything out and is too flimsy to hold back making stuff for different days. My two granddaughters both love it and have a great time making the models and are in "sticker heaven" when the magazine arrives. My nephew (age 5) loves this magazine lots to do to keep him entertained. A good choice indeed! really great ideas for kids. Excellent gift idea my nephew had loads of fun from this. Some magazines can be quickly flicked through especially for kids but not this one. Hours of fun for !! I buy this comic for my grandchildren every month and its the best magazine ever. So much to do keeps them amused for ages and have been known to help out myself. My 3 & 5 year old regularly want to buy "a comic" as a treat when we're shopping. Often when I get home and we start to read the stories & do the activities, I am honestly shocked at how little they get for what is often a fairly expensive price. The 'free gift' toy on the cover is usually lost or they are bored of it within a few minutes and only seems to serve as a way to tempt children to beg for the magazine in question. HOWEVER, this is NOT the case with the CBeebies Art magazine. The cover 'goodies' are always the basic ingredients for a fun and simple art project that the kids can make with only a little help from a grown-up, and the magazine is packed with colouring, cutting/sticking, crafting activities that keep them amused for literally hours. I really do feel that this is about the only magazine for pre-school children that lives up to it's cover price. Couldn't be better and both the kids absolutely love it.